Al Ula oasis, situated in the Wadi Qura valley, is halfway between Madinah and Tabuk, around 370 kilometres north of Madinah. Many different peoples have lived here over the centuries, from Neolithic man to the Nabateans. Al Ula has a rare combination of striking geography, ancient history, ethnography and nature that makes it a fascinating place to visit. 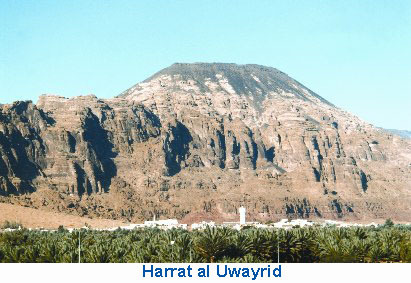 Harrat al Uwayrid, a 300 kilometre-long lava field, which runs from north to south, is on the western edge of the oasis. A rich, black crust of ancient lava (five million years old) coats the older, underlying sandstone platform, protecting it from erosion, and looking like chocolate coating on a cake. On the eastern side of the valley, opposite, the same sandstone, without a lava crust, has been eroded into a succession of pinnacles and plateaux. In places, the blown sand gives a light brown tint to the cliffs where it has settled temporarily. On most mornings, the western cliffs appear bright red as soon as the rising sun highlights them. Over a hundred years ago, the archaeologists and photographers Jaussen and Savignac surveyed the oasis. In their work, they mention several natural springs flowing north and east of Umm Naser, the pink sandstone pinnacle narrowing the middle of the valley. Nowadays, pumping and watering is done through the agency of man so that the palm groves cover 20 times the area that they did in 1907. As a consequence, the natural springs have disappeared, the central gardens have been abandoned and the old unwatered palm trees are withered, in contrast to the lush new green palms extending north and south of Umm Naser. Ten thousand years ago, the Umm Naser hill was a natural lookout tower for the Neolithic hunter-gatherers. The northeastern corner of this rock still bears the mark of their drawing capability: two rows of ibex - mountain goats with oversized curved horns. Further west, on a black slab of the cliff, there is a painting of four men joining hands, self-representation being a favourite subject at a time when early man could not yet write but was able to draw himself, and his hunting, on flat rock. 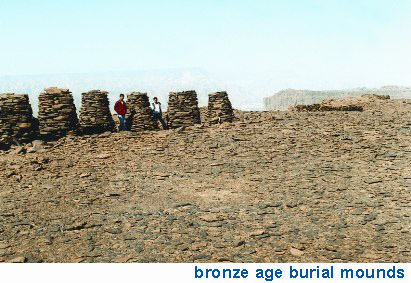 The next antiquities to be discovered in the valley by trekking tourists are the Bronze Age burial mounds or tumuli : all the summits around the present Al Ula city have 5,000 year-old graveyards, which are startlingly conspicuous on the skyline, when viewed from the bottom of the valley. Most of them have a 'tail' made of heaps of dry stones: either crude lava boulders, as on Harrah Belvedere, or sandstone slabs carefully assembled on the eastern and southeastern plateaux. Shape, size and spaces in between these cairns are so regular that these crenellations at the top edge of the cliffs are obviously man-made. Archaeologists specialising in funeral structures in the Middle East guess that this was the way the old nomads used to mark their territory. None of these tumuli have any writing on them; they are older than the burial caves, and built long before man started to write. The first scripts to appear on the rock are Dedanite, Lihyanite and Minean. 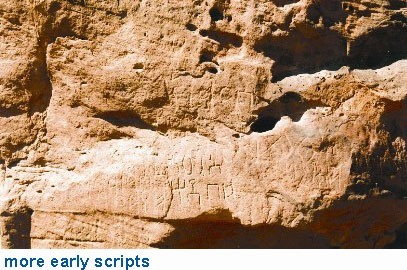 These scripts have an obvious connection with the Musnad script from south Arabia. Dedan was the former name of the Al Ula Oasis. Many other scripts of temporary visitors appear on the rock : Sabean, Greek and Nabatean; all of them carved by travellers known to have been involved with the frankincense business, as explained by Professor Abdelrahman al Ansary. 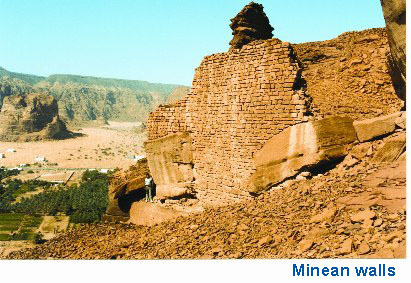 During the 6th century BC, the Mineans arrived in the oasis and created a colony of traders and partners of the Nabatean cameleers, even before these last took over the Al Hijir site and established a logistic and cultural base there, 25 kilometres north of Umm Naser. The kingdom of Main, now the Qarnaw area in Yemen, was involved in production, transport and delivery of frankincense to the Nabateans in Al Ula. Transport further north and distribution of the precious goods from the south to the north and outwards to their Mediterranean clients: Egypt, Greece and Rome, was the job of the Nabateans. To protect their trade and their settlement in the side valley of Tallat al Hammadi during the four centuries of their rule, the Mineans built in Jabel Khoreibah an impressive walled stronghold, three kilometres long from north to south and two kilometres wide from west to east. The walls are made from marvellously trimmed stones, or hewn from the hill slopes to create a vertical and smooth obstacle, sometimes with a dry moat. The highest pinnacle in the southeast corner of this fortress is the dungeon of this mountain garrison. You can reach the top of it by means of sophisticated stairways hewn in the rock, and then enjoy stunning views of Wadi Qura and the hills. In his thesis dated 1981 AD, Professor Abdallah Nasif was the first archaeologist to offer a detailed description of this 2,400 year-old military layout. Before him, Jaussen and Savignac were accurate about the Minean oven-like tombs but they provided few details about the inaccessible Qasr (castle) higher in the mountain. Clear identification of all these Minean structures has been possible thanks to several writings on the rock referring to the faraway Minean kings and to their local Kabir (governor). The Bani Lihyans, a western tribe of cameleers also settled themselves in Wadi Qura, at approximately the same time. They added their mark with embossed writings on the rock, in three different locations across the valley: a Lihyanite temple at the top of Jabel Umm Daraj; an open air 'history book' on the eastern cliff of Jabel lqmah; and a second temple at the foot of the Khoreibah cliff. It seems that Mineans and Lihyanites cooperated for some time in the same trade. It is generally accepted that the Lihyanites eventually took over the full partnership with the Nabateans of Al Hijir when the Mineans were badly defeated by the Ethiopians in the south in 200 BC, for at least as long as the inland transport was profitable. Around 75 AD, the Roman initiative to divert the frankincense trade from inland to the Red Sea compelled the Dedan and Al Hijir people to survive on agriculture under the palm trees or to move away. After the advent of the Islamic faith, from around 620 AD, when Allah ordained the Haj pilgrimage it gave a new life to the oasis. On the way to Tabuk following the expansion of the Islamic faith, the Prophet Mohamed (Peace be upon Him) stopped for prayer at the Mosque south of Qala'at Musa ibn Nuseir, the tiny fort watching over the old mud brick village of Al Ula. 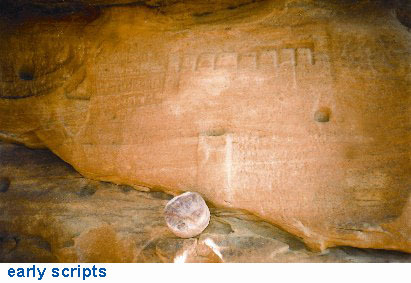 At several locations, some Kufic Arabic writing on the rock can be seen side by side with other older scripts. In Al Ula, the pious caravans from the north used to rest for 3 or 4 days in the oasis on their way to Madinah, except during the period from the 7th to the 13th century AD when Al Ula was bypassed for the benefit of Mabeyat, an Umeyyad built city only 20 kilometres further in the southeast. In 1907, the Hejaz Railway track reached Al Ula. Al Ula has five buildings that are typical of stations all along the 1,325 kilometres of line from Damascus to Madinah. Al Ula station comprises: the station master's residence, ticket office, surveillance fort for 15 soldiers (ground floor only), water tower and windmill. As AI UIa was an infantry headquarters 980 kilometres south of Damascus, special care was devoted to its strength. From Jabel Zurah in the north, to Jabel ar Ruzeqiyah in the south, seven different Ottoman strongholds controlled the main summits overlooking the rail track. Every one of them is a pleasant one-day trekking destination, giving a birdseye view over the oasis. After climbing a 200 to 300 metre-high army mule track, a complete military post is laid out in front of the spectator. These posts have long drystone defensive walls, watchtowers on key points of the plateau, blockhouses, and a command post. The Regional Archaeological Museum (open from 8:30 to 14:30 Saturday to Wednesday) explains all these sights from a historical perspective, and is well worth a visit. One of the sections is devoted to local wildlife. Although ibex cannot be seen any more, you can observe gerbils, foxes, hares, Egyptian vultures... and even wolves still roaming around. If you base yourself in one of the Al Ula hotels, you can explore nature and history (and your physical fitness!) to your heart's content. Al Ula has about 30,000 inhabitants, and so provides many services for the tourist, such as a hospital, shopping centres, facilities for relaxation and the museum mentioned above. Al Ula can be reached via four airports: Madinah (390km), Hail (420km), Tabuk (490km) and Al Wej (220km). There are hotels providing a pick-up and drop-off service to whichever airport you prefer, and guided sightseeing. The best time to visit is from November to April.